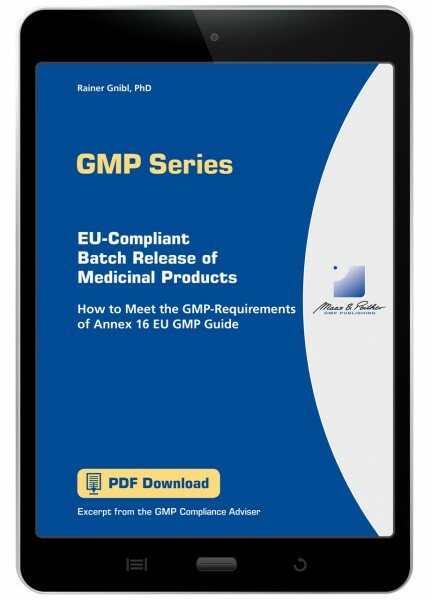 How to Meet the GMP Requirements of Annex 16 EU GMP Guide Batch release is complex and challeging due to requirements, responsibilities and the global product flow. Make sure to safely circumvent the multiple pitfalls that lie in wait. batch release as a change of status. Requirements, responsibilities and the global product/process flow are complex and challenging. The report How to Meet the GMP Requirements of Annex 16 EU GMP Guide helps you to safely circumvent the multiple pitfalls that lie in wait. What does an EU-compliant batch release of medicinal products look like and what individual steps does it involve? What requirements does it have to meet? What requirements apply to imported products? What responsibilities does the certifying Qualified Person have and how can he/she fulfil them? What support systems are available to the Qualified Person? What responsibilities does the certifying Qualified Person have for products fully or partially manufactured by contract manufacturers? How can the certifying QP meet the challenges of a complex global product/process flow? Order your copy of How to Meet the GMP Requirements of Annex 16 EU GMP Guide and learn the best practice of batch release.